this has to be my fave of all time i bought this on video about 14 years ago me and the missus once invited all our friends around on a christmas eve for a party and for some unknown reason we decided to put this video on and after about 10 minutes the lounge was full of about 12 adults absolutely glued to the tv. we were in absolute stitches every time he shouted out haaaaaarrrrrrooooooooooooooooold........! wheres that tea.! i have enjoyed watching the repeated episodes on tv over the years and have collected about 16 episodes including the 2 films. i am now 37 years old and my daughters are 12 and 7 they often ask to watch some episodes too... how many comedies from about 40 years ago can you say that about! 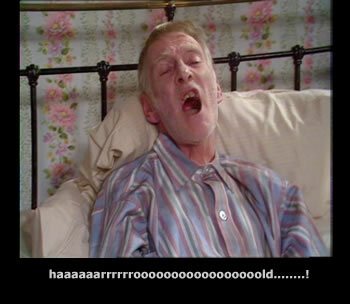 This is a classic episode,albert being ill in bed & taking advantage of the situation is tv gold! If any other reviewers have seen it the resolution of the episode -with Harold getting his own back is fantastic. It's a shame it's not shown very much now as I think more people should see it as it is one of the best ones. The acting by the two leads is excellent as always. There are so many funny parts to this episode but just want to run through a few of em'. When Albert realises his back is ok and he starts dancing is priceless. Also when Harold discovers the truth and goes upstairs to ask Albert what he wants for tea---Harold blatantly says" what about 2 cans of lager and some licorice alsorts-PINK ONES" again Alberts face is a picture! At the end Albert screaming " Me Ghoulies are on fire"
Just want to say that when Albert finds out that he's not really ill and starts dancing it is hillarious-would love to copy that move in a bar in some Drunken way! One of the best remembered and most loved episodes.